If ever there was an excuse for hibernating and enjoying the indulgence of a lie-in, autumn is it. Of course, lie-ins inherently lead to brunch and for me, that equals one thing... pancakes! 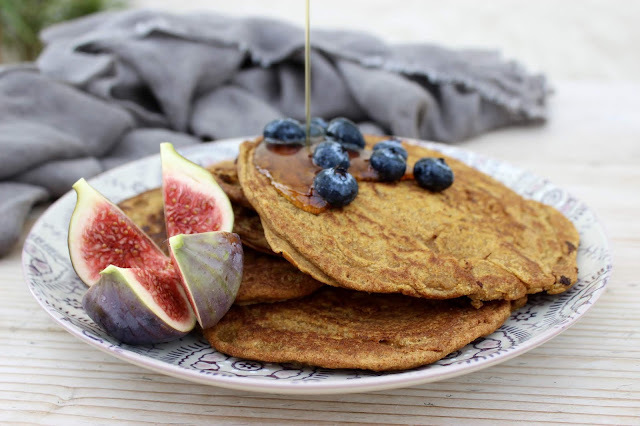 I'm so excited to share this recipe for Pumpkin Spiced Pancakes with you as I'm sure you'll love them and agree that they practically taste of autumn! Rainy day and cozy knits optional, but highly recommended! 1) Place the buckwheat flour, almond milk, pumpkin puree, almond butter, baking powder, vanilla extract and spices (cinnamon, ginger, nutmeg and cloves) into a blender and blend until smooth. It'll form a fairly thick batter. 2) In a small non-stick frying pan, melt 1 tsp of coconut oil over a medium high heat. Add approximately half a ladle of the batter, forming into a circle shape of even thickness and cook for a couple of minutes until it starts to bubble and set. Flip over and cook for a further minute. Remove and set aside on a plate. 3) Repeat step 2, adding more coconut oil as necessary, until all of the pancake batter is used up. Top the pancakes with your favourite toppings- I like maple syrup and fresh fruit.